Windows 7's built-in games are attractive and even occasionally addictive, but real gamers will want to install their own games. One of the big questions, however, concerns compatibility: how compatible is Windows 7 with the mammoth collection of Windows XP software out there? The question is particularly problematic for gamers, who tend to take more advantage of low-level hardware features that are typically hidden within Windows. And, of course, many of these people skipped right over Windows Vista out of fears—warranted or not—that it would be problematic for gaming. The other big gaming-related question, of course, is whether Windows 7 measures up, performance-wise, with Windows XP. We know that with the original shipping version of Vista, the answer was no, though Microsoft fixed most of that system's performance issues by the release of Windows Vista Service Pack 1 (SP1). With the passage of time, most gamer-related hardware drivers had improved to the point where the performance differences between Vista and XP became minimal. With the release of Windows 7, we're seeing even better performance, and Windows 7 runs fantastically well even on low-end netbook computers, a feat that was well beyond the capabilities of Windows Vista. Put simply, performance is no longer an issue, even for gamers. In our testing of 3D game titles (hey, someone has to do it), we've found Windows 7 to be extremely compatible with everything from so-called legacy game titles to the most modern shooters available. In most cases, there's no work to be done at all: you simply install the game as always—albeit with the occasional User Account Control (UAC) prompt—and things simply work as expected. Some games, especially older games, will require a bit of prodding. 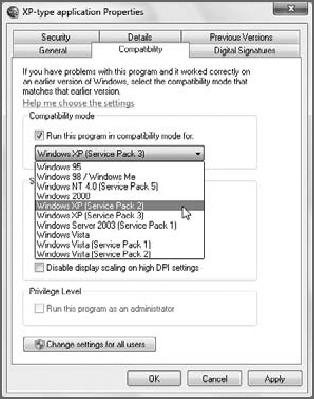 In some cases, Windows 7 includes compatibility information about certain problematic game titles, and in others you'll need to manually set up the game's shortcut to run in Windows XP or Windows Vista compatibility mode before it will run. Figure 1 shows the interface for setting the compatibility mode for a poorly behaving application. Figure 1. Some games expect to run on a certain version of Windows. That's okay; we can fool them into thinking just that. Although this isn't documented anywhere, it's quite possible to add games you've installed on your PC to the Games special shell folder, so you can access them as you do the built-in games. Presumably, newer game titles will do this automatically so that they can integrate more closely with the games-related infrastructure Microsoft created in Windows 7. But if they don't, you can make it happen yourself. To do so, simply drag a game shortcut into the Games Explorer. 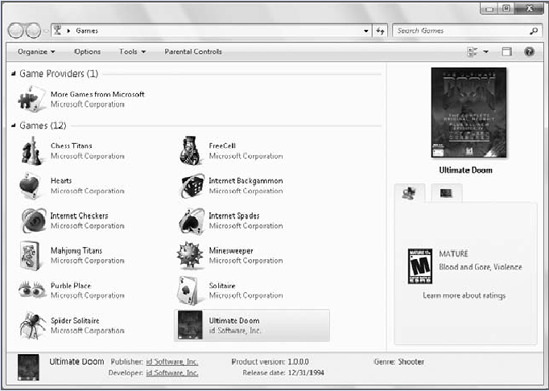 As shown in Figure 2, legacy games such as Ultimate DOOM can be added directly to Games Explorer. Many games will be added automatically, however, so check before dragging and dropping. Figure 2. You can add your own games to the Games folder, too. When Windows Vista first appeared, gamers were advised to avoid x64 versions of the operating system in order to avoid any potential compatibility problems. This is no longer an issue, on either Windows Vista (with Service Pack 2 or higher) or Windows 7. Now, x64 versions of Windows are roughly as compatible as their 32-bit counterparts; and thanks to certain advantages of running on a pure 64-bit OS, including the occasional availability of 64-bit-specific games, x64 versions of Windows 7 are in fact the more desirable platform for gaming. There's no longer any need to be scared of x64.